Our one bedroom apartment is in Lagos Marina, on the second floor. It is beautifully furnished with both the living/dining room and bedroom having balconies enjoying wonderful views over the Palm tree garden to the Marina. We are only a few minutes walk from the wonderful beach of Meia Praia. You can also take a short walk to the town centre of Lagos and gaze at the yachts moored at the pontoons. The apartment comes with free wifi and an allocated underground car parking space accessed from the Meia Praia road. Complimentary swimming pool access at the nearby Marina Club Suite Hotel is also available. Use of the facilities at the adjoining health club is payable locally. There is also a playground for children in the near vicinity. The apartment is fully air conditioned providing a comfortable environment in the height of summer but also during winter. I was born in the UK, but after I met my partner Carla, who is Portuguese, I quickly fell in love with Portugal. We bought our apartment in Lagos Marina in the Algarve and we really enjoy spending time there, as we hope you will too. The sun, the sea and the chilled out atmosphere make for a holiday to remember. Bathroom has a shower over the bath, wc, bidet and a vanity area with large mirror. Hair dryer is provided. Heating is provided through the air conditioning system. Located on floor -1 with elevator access to apartment. Towels are provided for indoor use only. Please note we do not provide beach towels. A fitness room is available at the Marina Club Hotel next door and all services are payable locally. Cable TV with over 100 channels in Portuguese, English, French, German and other languages. A small selection of DVDs is available. 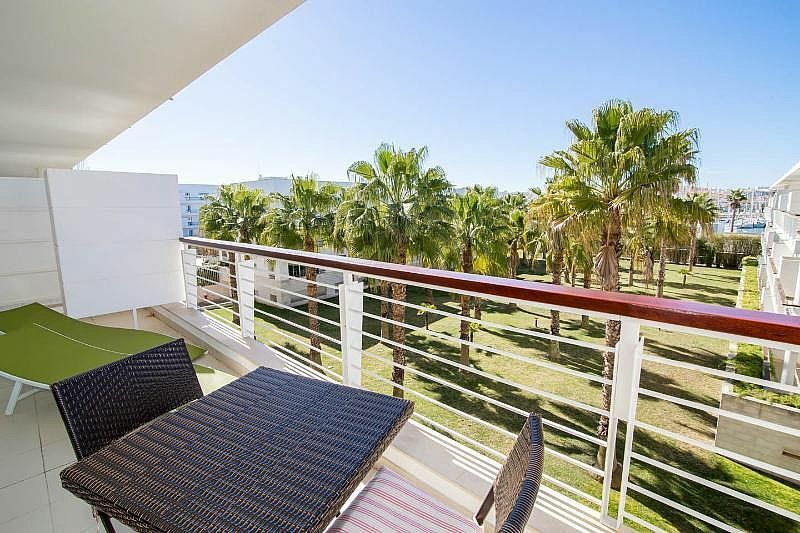 Both balconies are south facing with a view to the Palm tree garden and the Marina. The golf courses at Palmares and Boavista Golf Resort are within five to ten minutes drive and the courses at Penina to the east and Parque da Floresta Golf and Leisure Resort to the west are about 25 minutes drive away. Complimentary passes are available for the use of the Marina Club Hotel pool area in the adjacent building which boasts a large swimming pool with sunlounging area and also a smaller children's pool. A smoke alarm, fire extinguisher and fire blanket are fitted in the apartment. A welcome information folder with maps, information and instructions for appliances is also available. A selection of DVDs is available for guest use and the apartment has full air-conditioning and complimentary WiFi connection. Patio furniture for outside dining and 2 sunloungers are provided. The apartment has the use of the swimming pool in the Marina Club Aparthotel next door which also boasts a children’s pool. Towels and linens are provided and there is a cleaning service midstay , depending on length of stay (please enquire for clarification on frequency). We do not provide beach towels. A lovely modern, beautifully clean apartment with everything you would need for a great holiday. We slept very well as the bed was so comfortable, and the area is very quiet. The sun shone most of the day on both balconies even in January. The kitchen is very well equipped, and there is a supermarket close by and a great fish market in town if you wish to self cater. If not, there are lots of restaurants and cafes on the Marina and in town, which is an easy enjoyable walk. We loved this apartment, and it will always be our first choice when we return to Lagos. The apartment is on the second floor of a modern apartment block. There is a lift up from the garage floor which proved to be a great asset. The apartment, which is comfortably furnished and well equipped, faces south-west and overlooks a grass area planted with tall palm trees. Beyond, is the marina with yachts berthed for the winter. From the terrace it was interesting to watch the beautifully colourful Iberian magpies hunting for grubs etc. in the trees in the mornings. We were lucky in that the weather was balmy every day with no rain. The apartment is very conveniently situated. A short walk away in a northerly direction is a very good supermarket - also a dry cleaners, stationers and cafe.Towards the south, and along the marina towards a foot bridge to the town, is a fresh shellfish shop which sells catches from the boats. Most days we went over to the town via the bridge to sample the many cafes and restaurants. Some are tourist orientated and expensive, but we found a few more traditional Portuguese places serving delicious grilled sardines. There is a good bus service to Cape St Vincent and other towns along the coast. There is also a train service running east from Lagos. There is a rich history of marine exploration in the area. Prince Henry, the Navigator, planned journeys from Lagos. Not to be missed is the boat trip to see the rock formations and cliffs just outside the town. .All in all a very enjoyable visit! Our apartment is only a 10 minute walk from Meia Praia beach and 15 minute walk from Batata beach. Dona Ana beach and Luz beach are only a short drive away. We are located 45 mins drive from Faro Airport. As Apartment Dom Duarte is so centrally situated, a car is not essential for your holiday enjoyment, but to gain an appreciation of just what the Western Algarve can offer, a car is recommended. There are shuttle buses to Faro and the airport and the train station is only 400 metres away. The fabulous west coast beaches, where the surfing is renowned, are only 30 minutes drive away and the Monchique hills and the historic old capital of the Algarve, Silves, is an equal distance the other way. The nearest supermarket is 5 mins walking distance as are the nearest bars and restaurants. Zoomarine is 30mins drive away and Sagres and the West Coast 45 mins drive away. There are also seafaris, dolphin watching and other boating tours on offer to book on site.